categoria 11 – 14 ani: Mara Vasile (14 ani), eleva a Scolii Gimnaziale Herastrau din Bucuresti. categoria 15 – 19 ani: Zibileanu Maria Anne-Lisa (17 ani), Liceul Teoretic Grigore Moisil din Tulcea. categoria 15 – 19 ani: Iulia Diana Sasu, de la Colegiul National Pedagogic “Constantin Bratescu” din Constanta si Radu Diaconescu, de la Colegiul National “Sf. Sava” din Bucuresti. categoria 11 – 14 ani: Andrada Predescu de la Scoala Gimnaziala “Alexandru Davilla” din Pitesti, judetul Arges si Oriana Dumitru, de la Scoala Gimnaziala “Nicolae Titulescu” din Bucuresti. 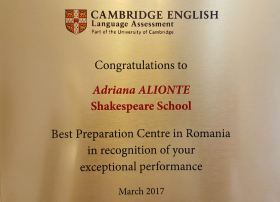 categoria 15 – 19 ani: Ioana Cristina Popa, de la Colegiul National “Cantemir Voda” din Bucuresti si Rares Calota, de la Liceul Teoretic International de Informatica (ICHB) din Bucuresti. Are video games an addiction or a mind sport? Describe your own views in a 200-word essay in which you mention what is your opinion about computer games. Do PC games cause dependence or are they a sport of the mind? Initially ‘mind sport’ meant first of all chess. But that was before the evolution of science lead to the development of computer games. Soon enough, computer games have also been considered mind sports. Computer games have become very complex and so children and teenagers dedicate much time to this activity. However, specialists do not consider excessive gaming a medical problem. – PC games help us develop logical thinking and hand-eye coordination. – Computer games help teenagers learn more about using computers. – Teenagers make new friends playing video games. – Computer games promote violence, poor health and lead to neglecting school. Describe your own views in a 250-word essay in which you mention whether you consider playing computer games is addictive or it is rather a sport of the mind. Initially chess, cards games and board games were described as mind sports but as computer science rapidly evolved, other disciplines such as computer games or e-Sports (video game-based competitions) have been accepted and included on the list of mind sports. As video games are becoming increasingly complex, fans dedicate more and more time to this activity. Some people argue that PC games cause dependence but gaming addiction is not yet officially recognized as a diagnosable disorder. – Playing computer games leads to cognitive development. – Computer games help teenagers and young people become more skilled in using computers. – Computer games promote violence and poor health. – Computer games encourage/discourage social interaction. What can older people learn from you and your generation? Describe your own views in a 200-word essay in which you mention how you define and measure success and what knowledge you could pass on to your parents. Imagine you have just read the story of a father and his son. The son is 25 years old and, although his career as a singer doesn’t earn him much money, he enjoys what he does for a living. Therefore, the son is much happier than the father who is nevertheless richer. However, the son’s life-style made the father reconsider how success is measured. Does being successful mean doing what you love most or earning much money? Does it mean exploring the world around you or is it something else entirely? Would you like to be happy like the son or rich like the father in the story? What is special and different about you and you education in comparison to your parents? What do you think you and others in your generation could teach older people? How would you define and measure success? Give us three examples of what you might like to teach your parents. Describe a time when your parents learned something from you. Describe your own views in a 250-word essay in which you mention how you define and measure success and what knowledge you could pass on to your parents. Do you relate more to the father or to the son? What skills, attitudes and habits do you think people in your generation have that older people might benefit from? Think of three examples of what you might like to teach your parents. 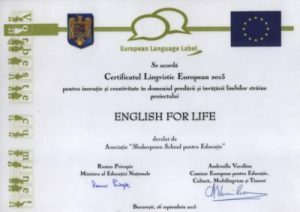 categoria 15 – 19 ani: Andreea Badeu (Colegiul George Cosbuc, Bucuresti). Citeste AICI despre experienta Andreei in tabara castigata la UCL. Profesor castigator: dna. profesor Catalina Georgescu. How can we keep Planet Earth ‘green’ for the future generations? Think green, speak green, act green and write a 200-word essay, in which you suggest an original way to use natural resources without polluting the environment. Right now on Earth there are over 7 billion people and by 2050, we will reach a population of about 10 billion souls! There will be so many of us on this planet that we will have to become more and more creative to ensure the future generations all the natural resources they need to survive. Things that are common to us, for example, fresh air, clear water, fertile soil, rich vegetation or fossil fuels, might disappear in the near future! In ecology, living on Earth without exhausting natural resources and destroying the environment, is referred to with the term sustainability. So, how can we live our daily lives in a ‘sustainable‘ way? How can we use less non-renewable, finite resources such as coal, petroleum, natural gas or metal? How can we use more renewable resources like wind power, solar energy, hydropower, geothermal energy, to power our homes and thus live in ‘green houses’? How can we use fewer goods and commodities (water, electricity, fuel, paper, food, etc.) that we use every day at home or at school? How can you convince your parents to do the same? What should you be taught at school to help you contribute to a better future in a less polluted world? Think green, speak green, act green and write an essay of max 250 words, in which you suggest an original way to use natural resources without polluting the environment. Right now on Earth there are over 7 billion people and by 2050, we will reach a population of about 10 billion souls! There will be so many of us on this planet that we will have to become more and more creative to ensure our descendants all the natural resources they need to survive. Things that are common to us, for example, fresh air, clear water, fertile soil, rich vegetation or fossil fuels, might disappear in the near future! In ecology, living on Earth without exhausting natural resources and destroying the environment is referred to with the term sustainability. So, how can we live our daily lives in a ‘sustainable’ way? How can we reduce the consumption of resources (water, electricity, fuel, paper, food, etc.) that we use every day at home or at school? Our daily life includes many activities that lead to a greater consumption of resources, some of them are also polluting the environment, for example, driving cars. What solutions can you find in order for these activities to become less harmful to our planet? Modern families tend to buy more products than they consume. This way significant resources are used and ever growing amounts of waste, that pollute the planet, are being generated. What solutions can you find to determine people to become ‘rational consumers’ and reduce pollution? What should be changed or introduced in modern education to ensure children a better future in a less polluted world? Citeste AICI eseurile castigatoare ale acestei editii. categoria 15 – 19 ani: Baicu Diana Nicoleta. Citeste AICI despre experienta Dianei in tabara castigata la UCL. Are freedom, happiness and health the notions that cross your mind when thinking about school? Are you ready to rewind, innovate and acquire a fresh approach to the educational system? Watch the inspirational speech of Logan LaPlante, a teenager just like you, telling you about an innovative concept: Hack Schooling! Logan discovered the key to a different kind of education and a happy, healthy exciting life in which personal development is the pathway to success! Expand on his views of an educational system that teaches people the art of being happy in life. Imagine that you have all the money, skills and resources in the world to create the IDEAL educational system. Watch the video below and write a 200-word composition to describe what school should teach you to provide you with real education and help you become a happy and successful person. How you would change school. What new subjects would help you become a successful adult. What would the teachers teach you in order to make a real difference in your life? We believe that the current school system is teaching you how to make a living, not a life. As George Santayana once said, a child educated only at school is actually an uneducated child. So, what if we made education about how to be Happy and Successful? How would you reform the current educational system? What type of skills would you acquire throughout school? What topics would help you become successful in life? Great news! The European Union has decided to start a country from scratch and you are the leader of this country. Of course, this is only pure imagination, but what if it were true? What if you could live in the Buckingham Palace, have dinner with Einstein, eat French food and Belgian truffles, while admiring the Colosseum from your bedroom window? What if the beautiful Greek sand was right in your back garden? Write an essay about a new European country you would build and imagine you are its leader. two or three European icons you would take with you to this new country. What would they be? Why would you choose them and to what effect? You should write no more than 250 words. Send us your essay and you might just be the winner of our Essay Competition! Win a two-week summer camp in a famous British university campus! Let your imagination run free and make your dreams a reality! Write an essay about a new European country you would build and imagine you were its leader. three or four icons of European origin you would take with you to this new country. What would they be? Why would you choose them and to what effect? You should write no more than 350 words. Imagine you could live an extraordinary experience: you would be amazed to find out that, for one day, you could swap places with one of your parents. You would be your mother/father and the parent would become you! This is your chance to tell us about the most out of the ordinary and strangest events! Could it be true, then, that conforming to nonconformism makes one a conformist? Write an opinion essay of 350-500 words on the above-mentioned statement, give it an original title and blow our minds with your revolutionary take on breaking patterns! Prove that true ingenuity in pattern-breaking can make you the winner of an amazing summer school in the UK! In a society in which the basic tenet is that Money makes the world go round, what is the meaning of volunteering? Are the people who get involved in volunteering programmes utopians? Do you honestly believe that volunteering brings advantages to both volunteers and the assisted ones? Write an essay of maximum 500 words, give it a catchy title and offer enough reasons to convince us that volunteering can change our society for the better.